Epoxy flooring in Boise is a unique liquid-applied floor system that looks like paint but is anything but. 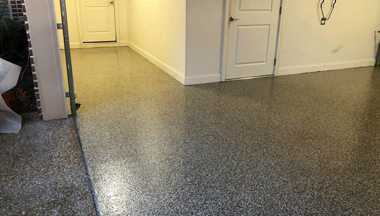 An epoxy floor system is made with hardeners and resin that chemically react to form an ultra-strong plastic shell bonded to the concrete itself. An epoxy floor coating in Boise, ID isn’t sitting on the concrete: it bonds to actually strengthen the concrete and increase its tensile strength. With a seamless and nonporous surface, it can repel chemicals, moisture, and more without showing wear and tear or stains. We install industrial-grade epoxy flooring formulated for even the most demanding environments like factories, hospitals, offices, restaurants, and processing facilities. An epoxy garage floor won’t be hurt by gas and oil spills, chemicals, road salt, or even hot tires. 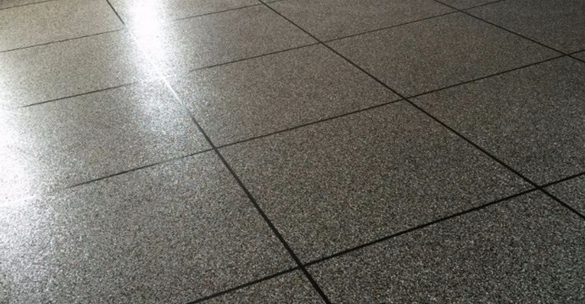 It maintains a bright and clean appearance thanks to its durable and seamless structure that also prevents liquids from seeping into your concrete. An epoxy garage floor in Boise, ID has a lot to offer. 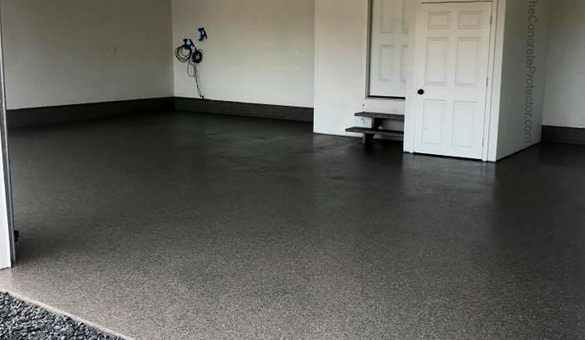 This low-cost floor coating protects your concrete and transforms your garage into bright, usable space you’ll be proud to show off. Your garage can become more than a dusty mess: imagine a sleek home gym, clean workshop, or your own personal auto showroom. Here are just some of the benefits of garage epoxy that make it a smart investment for your home. Don’t waste your time with concrete paint and other floor systems that aren’t up to the challenge of surviving in a garage. 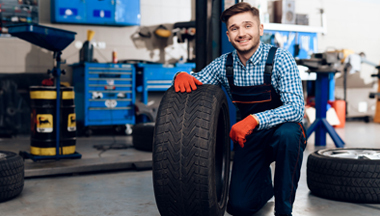 A garage epoxy coating is formulated to withstand all types of perils like hot tires, extreme temperatures, chemical spills, gasoline and oil, moisture, road salt, and much more. You don’t need to worry about the lawnmower damaging the floor or stains from spills. Epoxy performs well in almost all conditions and maintains its appearance for up to two decades. You want an attractive and clean garage floor but you don’t want to spend a fortune? 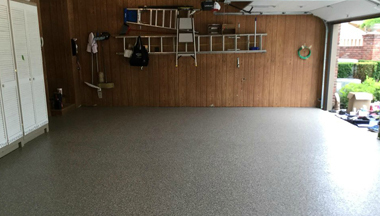 An epoxy garage floor in Boise, Idaho is just what you’re looking for. An epoxy garage floor coating can cost $5 per square foot or even less depending on the colors and effects you choose. It can also last up to 20 years and require no special care for a low lifecycle cost. Hiring garage floor epoxy contractors can also be a smart investment in your home with a great return on your investment. Don’t waste your money on concrete paint or DIY garage epoxy kits. No matter how great they look at first, these products simply aren’t made with longevity in mind. Garage epoxy kits, for example, usually contain 30-40% solids compared to 100% solids in high-grade epoxy. Inferior products typically fail after just one or two years. The money you save during the first application will quickly evaporate when you are forced to reinstall the floor every 2 years. 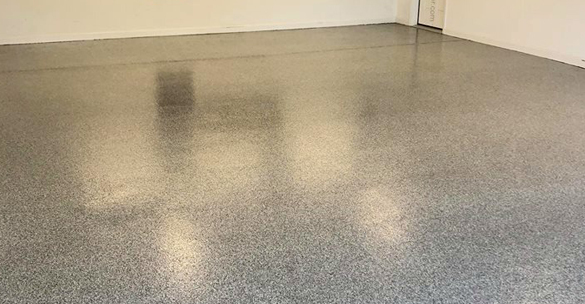 Our professional epoxy garage floor systems can easily last 10-20 years and maintain their beautiful appearance with ease. Your garage is probably cave-like and dark now but it can be a bright and welcoming space with the right epoxy garage floor system. Garage epoxy can brighten your garage floor by up to 300% to make it easier to see what you’re doing, find dropped objects, and spot hazards on the floor. Epoxy feels much like a basketball court underfoot but we can add slip-resistant additives or flakes to your floor to make it even safer and reduce the risk of falls, even when the floor is wet or dirty. Did you know a Boise epoxy garage floor is one of the most customizable floor systems you can choose? Our epoxy garage floor installers have years of experience installing all types of epoxy systems and decorative finishes. You may want something simple like a solid color or a granite flake epoxy system with colored flakes broadcast over the surface. We can also do custom patterns and effects like an end zone, checkerboard, or even the look of granite tile complete with grout lines. One of the most impressive looks we can achieve is a metallic epoxy garage floor, a unique design option that should only be done by experienced professionals. This gives you a 3D look with movement and depth that can look like anything from molten metal to sparkling water.